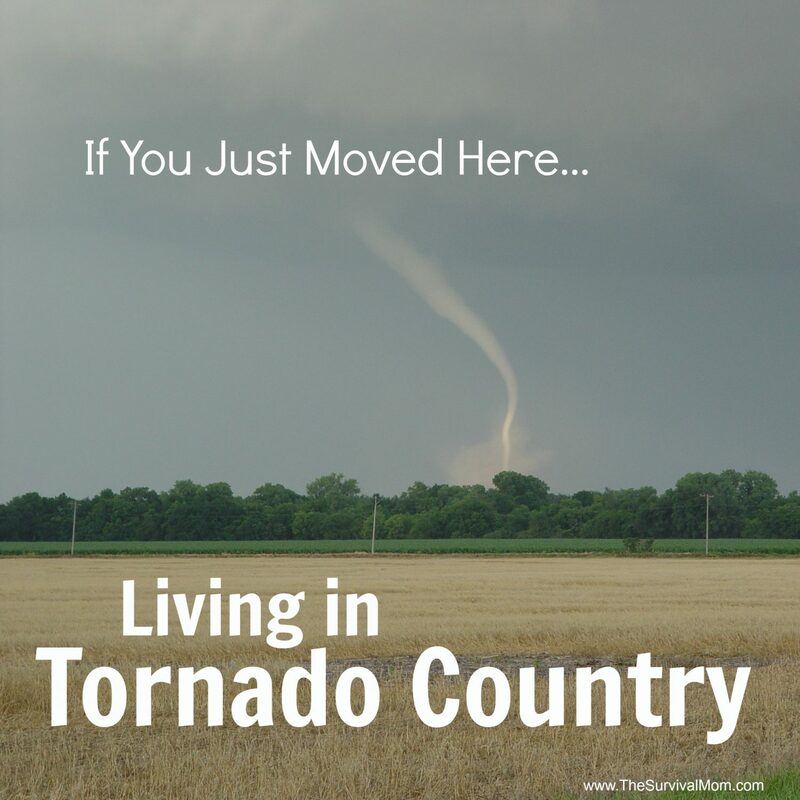 Most people know about Tornado Alley which includes northern Texas, Oklahoma, Kansas and Nebraska at its core (though the boundaries are not completely defined). Some may even know about Dixie Alley, the Southeast’s tornado corridor that encompasses much of the lower Mississippi Valley, including parts of Texas and Arkansas, Louisiana, Mississippi, Alabama, Georgia, Tennessee, Kentucky, and parts of both North and South Carolina. Tornadoes are less frequent in numbers in Dixie Alley but often are stronger and have longer tracks. They also cause more damage because of greater population density than in much of the Tornado Alley region. The United States has more tornadoes than any other country, averaging about 1,200 per year. EVERY state has had tornadoes. Most occur east of the Rocky Mountains. Florida has the most per year per square mile but they are typically small. Oklahoma has the most violent tornadoes per year per square mile. Alaska has only had two tornadoes since 1950. Texas. Mississippi and Alabama have had the greatest number of tornado deaths. Tornadoes have occurred in EVERY month of the year. The main “season” is March through August but different areas have their own “peak” months. For example, historically Alabama sees more tornadoes in April and November than any other month. Tornadoes have happened at EVERY hour of day and night, but are most common between 2 and 8 pm. 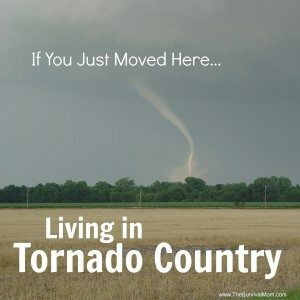 So, if you’ve moved into a more tornado prone area, here’s what you need to know. 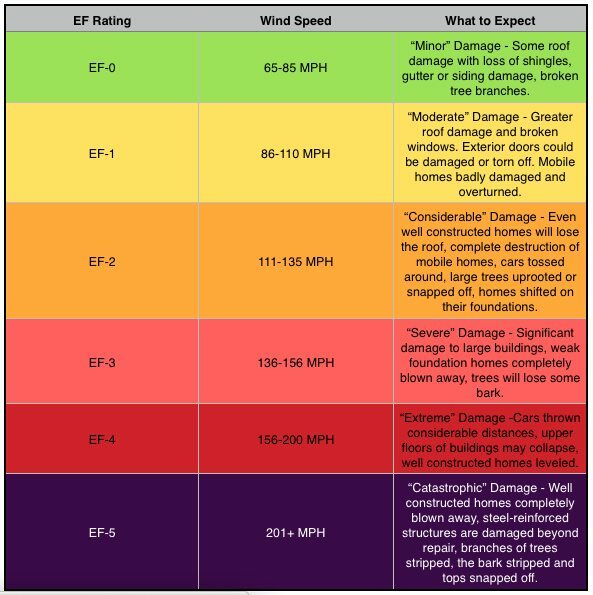 Tornadoes are classified using the EF (Enhanced Fujita) Scale from weak EF-0 tornadoes to a catastrophic EF-5s. 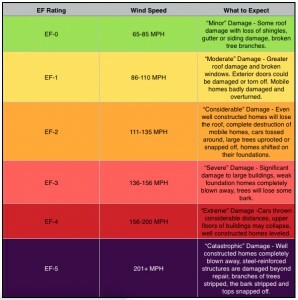 The scale is based on wind speed and expected damage to certain types of buildings and vegetation. You may hear the weatherman giving you information about tornado watches, warnings, and emergencies. Here’s what each means and what actions you should take. Tornado Watch – Conditions are favorable for thunderstorms that can produce tornadoes. Prepare your safe place if it is not already set up. Tornado Warning – A funnel cloud has been reported, a tornado has been sighted, rotation is seen on weather radar, or a waterspout is headed toward land. If this is in your area, you need to be waiting it out in your safe place. Tornado Emergency – A strong or violent tornado is on the ground and significant, widespread damage, injuries, and loss of life is expected. If a tornado emergency is declared and you are in the path of the storm, you must be taking shelter, preferably underground, and bracing for impact. While you can learn a lot and get broad information from a source like The Weather Channel, nothing beats your local weather forecasters. They know the specific meteorological history, topography, and unique characteristics of the areas they cover. With the advanced weather forecasting technology available today, forecasters can sometimes give several days “heads up” to potentially tornadic weather. One of the best ways, besides watching local news, to keep on top of impending weather is to have a weather radio in your home. 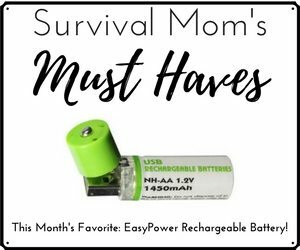 It can be programmed for your specific location and will run on batteries during power outages. Most can even be customized to only alert you to certain information. Mine is set up to sound for warnings and emergencies, not for watches. Determine if your neighborhood has tornado sirens. If it does, find out what each warning sound means to you. Some only have one sound. Others have multiple sounds depending on what they are warning for. For example, on or near military bases, there may be different sounds for weather, for general shelter in place order, and for hazardous materials issues. Remember, tornado sirens are really intended to warn people who are outside of their homes when impending weather approaches. You may not hear it from inside your house during the day. During the relative quiet of the overnight hours, the tornado sirens might be more clear inside, but do not depend on them to wake you up. (But your weather radio will!) If you do hear a siren, be sure to move indoors and turn on your television or radio for more information. You can still get warnings even if you aren’t at home as a storm approaches. There are plenty of weather apps available for your phone. The American Red Cross has a tornado app and many news stations have their own specific weather app. Like your weather radio, you can often customize the warnings based on your address, current location, and/or type of warning you prefer. A benefit of many of the weather apps is that you can put in other addresses besides your home and receive alerts for all of them. 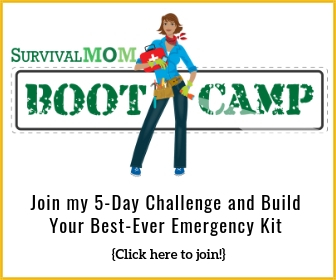 You can include the address for your work or a family member’s home, or even your child’s school or college. Don’t be scared! Be Prepared! Even in more tornado prone areas of the country, the odds of a twister hitting your home are slim. But it does happen. Be as prepared as possible, stay informed, and be alert. 3 Powerless cookers you can make using scraps! 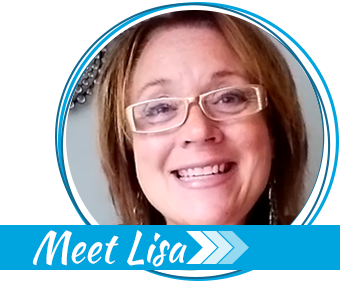 Amy is an Air Force Brat and an Army Wife. 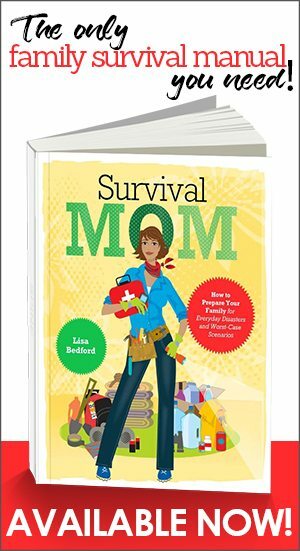 She learned early on that being prepared was essential since natural disasters follow her. Thank you SO MUCH !! I’m a french mom, I’ve always loved USA and one of my dreams is coming true. My family and I are going to move in Hattiesburg, ms. But I’m so terrified to live in that town with my children. I read your article and I was a little relieved because there are so many information and advices. thank you so much. Welcome Elodie! And what kind of natural disasters happen in France? Flooding I’m pretty sure.